Oh my! These are so stinkin' cute! 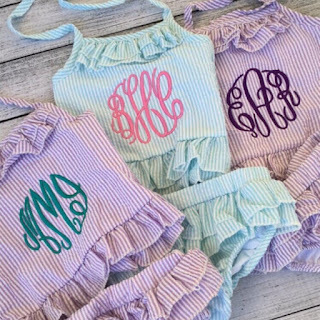 Right now these Monogrammed Girls 2 Piece Swimsuits are JUST $24.99 (Retail $38). Swim time! Your little swimmer will look too cute in my two piece swimsuits. The suits come in two styles and 7 color combinations in sizes 12mo-5T. The monogram is machine embroidered, which will hold up in both chlorine and saltwater.